Few people in New Zealand can afford to buy a house for cash. Unless you have just won a Lotto Jackpot or inherited a few millions you are likely to need a mortgage loan, or “mortgage” for short, to purchase a home for your family. Please note: The following explanations are simplified and may not necessarily reflect all the specifics of your particular case. Always consult your lawyer or an authorised financial advisor before making the final decision to buy or sell a property. Mortgage is a loan from a lender secured by a property. In most cases the lender is a bank and the property used to secure the loan is the house you are purchasing. Sometimes the mortgage is provided by a so called “second tier lender” instead of a bank – these lenders include various finance companies, credit unions, PSIS, and so on. Apart from slightly higher interest rates and some different conditions the mortgage usually works the same whether it’s from a bank or from a second tier lender. In the rest of this article we will use the terms bank and lender interchangeably with bank meaning any kind of a lender. In a typical residential home purchase the buyer provides a deposit of around 20% of the purchase price and the bank comes up with the remaining 80% in a form of a loan with a specified interest rate. The buyer than makes weekly, fortnightly or monthly repayments that cover both the interest accrued over the month and a principal repayment that reduces the amount owed to the bank every month. After a number of years the mortgage loan is eventually repaid and the property becomes mortgage free. A typical 3 bedroom residential house in West Auckland costs around $400,000 in 2014. As a buyer you need a deposit of only 20% of that amount, which is $80,000. The bank will provide the remaining $320,000 as a mortgage loan. Together it makes the required $400,000 and you can proceed with the purchase. The bank agrees to have the $320,000 loan repaid over the next 25 years and offers an interest rate of 6% per year. At that point you become a happy new home owner and start repaying the mortgage. The repayments are going to be around $2000 per month, every month, for next 25 years! The bank will check every month that your promised mortgage repayment has arrived on their account. Don’t even think about being long term sick or becoming unemployed. The bank will demand their $2000 regardless of your circumstances. Tell your bank that you need to postpone the next few payments. As embarrassing as it may be do it before you miss the first one. Really! They will quickly find out anyway. Arrange mortgage holiday if possible. If the bank knows you are not going to pay and they agree to defer the next few payments you’re technically not in arrears and not defaulting on your mortgage. That gives you some time to sort out your situation and save your credit rating. Once your financial position improves resume the payments as soon as you can, even if your mortgage holidays are not yet over. That will save you money. Unfortunately not everyone handles the situation this way. Many people let the repayments slip into arrears, then they avoid contact with the bank and ultimately they default on the mortgage. After some time the bank has had enough and calls the loan up. At that point the real trouble begins and a mortgagee sale is on the way. Until your mortgage is fully repaid the bank holds the property, i. e. the house, as a security – a protection against losing the money they lent you. If you don’t pay as agreed they can sell the house to repay the outstanding mortgage balance. This is called a mortgagee sale – mortgagee is the bank, the lender. Mortgagor on the other hand is you. The bank is the mortgagee and is selling your property, therefore it’s called a mortgagee sale. At that point the bank is in a situation where the loan with some $300,000 of outstanding balance is not being repaid. Even if your house may be worth $400,000 will they bother selling it for the top dollar? Unfortunately not! They will sell in a mortgagee auction for just enough to repay what they are owed. Say good bye to your deposit and your equity. Even worse – sometime they will agree to sell it for less that the outstanding balance leaving you with no house, no money and tens of thousands of unsecured debt that you would still be liable for. Not even mentioning your now severely damaged credit rating that will prevent you from obtaining any decent loan for a number of years to come. Enforcing a mortgagee sale is a lengthy and expensive process for the bank. Therefore they will probably give you enough warnings and enough time to rectify the situation. At first they will want you to repay all the outstanding arrears. If you can repay those $5,000, $10,000 or $20,000 within a couple of weeks they would stop the sale. More likely than not you don’t have that money, do you? Contact us as we may be able to help without you losing your house and without incurring more debt! If you don’t repay in time you will be served a “Property Law Act notice” (also known as PLA notice or mortgagee sale notice). Somewhere in that letter you will find a redemption price – that’s the outstanding balance of the loan plus fees and penalties added on top. After receiving that letter you will generally have 4 weeks to repay the whole amount. The whole $300,000+fees+penalties in 4 weeks! Act fast and talk to us! Your only reasonable chance at this stage is selling the house for a higher price before the bank does so for a low price. 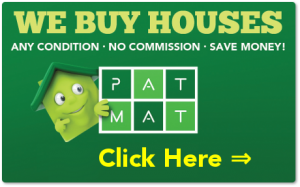 Talk to us today – we may be able to buy your house with no fees and no commission to pay. That’s certainly a better deal than the bank offers. Just contact us to find out if we can help!